I went away to college (Alfred University) to study art in the ‘60s and fell in love with clay. During this period pottery was bound by tradition, defined by utilization. This aesthetic was being challenged at the time by Paul Soldner, a pioneer in the field. With his influence the basic approach to clay work expanded and ceramics started the journey from craft to fine art. In 2001, after a 25 year break to raise my family I came back to ceramics. What Soldner started had taken hold and it was exciting to learn that now nearly anything goes. This opened a whole new world of opportunities for me. Serendipity is the order of the day in my studio. I make pottery because its fun and all-encompassing, and I learn (and perhaps teach) something new every day. The greatest pleasure for me is the idea of sitting down with 50 pounds of clay, playing with form and discovering the variations and possibilities held within. The teapot form captured my imagination after a creative accident a while back, and I’ve taken this form in a myriad of directions since. I pile on little cups, cut the forms, crush them, add miniscule teapots, create funky lids, add feet, alter the shapes, and more... making them functional... or not. Folks smile and often laugh out loud when they see my work - it’s truly rewarding! 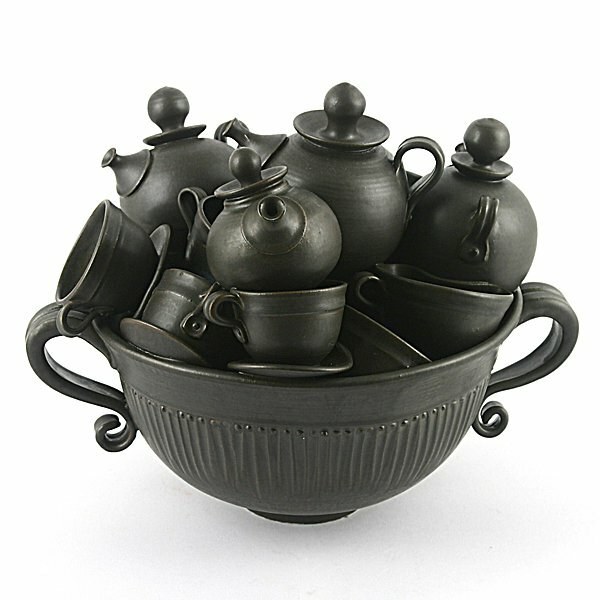 My multi-piece sculptural teapots have evolved to include bowls, platters, etc. Always with an eye to balance and the interplay of light and space, each piece becomes its own voice.